I’ve had a mild obsession with London rooftops since my formative teenage years were spent escaping authority on the lid of an NCP car-park opposite my school in Hammersmith. In later years, memories of afternoons wasted away in a blissfully forgotten space floating above the chaos and stink of W6 left me wondering why, in this crowded, overstretched, overworked city, we don’t take more advantage of the acres of space that the rooftops of London provide. Hannah Barry, 25 year old artist, curator and gallery manager from Peckham, seems to have shared similar thoughts and is currently in the third year of producing ‘Bold Tendencies’, an outdoor sculpture gallery located on the top floor of a multi-storey car park in Peckham Rye. Despite having received critical acclaim from the art world in the past, this year the addition of Frank’s Bar—a pop-up rooftop boozer—has unsurprisingly drawn the masses with a winning combination of art, outdoor drinking and epic vistas across London. Frank’s Bar sits proudly on one corner of the open air sculpture garden, a mighty-looking red pirate ship of a structure protected by a sweeping canvas awning. Designed by recent architecture graduates Paloma Gormley and Lettuce Drake, the temporary bar is designed to feed, water and shelter visitors on top of the world throughout the months of summer. It boasts pretty decently priced drinks, a food menu of nibble things that look and taste like young drunk arty types made them to survive (hummus, roast veggies, ox heart, bread), and three eco-style festivalesque toilets, one of which wins the award for the best piss view in London. The night we visited to shoot the rooftop we were hit by a monster thunderstorm that flooded the bar with monsoon rain and real live lightening. The natural entertainment reduced the crowd to an excitable giggling mass, huddled under the red awnings as the water poured down around, stranding one and all in a swampy boat of Campari and beer till closing time. After a cutting review in The Guardian, it’s clear Frank’s has created fans and critics alike. Sure it’s not the slickest bar in town, but hell if you wanted slick you wouldn’t jump in a piss-stained lift in Peckham to get it. Sure it did rain inside a bit but a drop of water never harmed anyone, and if you want to sip an ice cold £2.50 beer with a panoramic view of London town and beyond, well you have to take the rough with the smooth. Frank’s Bar and the Bold Tendencies show (I did look at the art, honest) is a champion of roof-seizing, space-stealing, urban-bending creativity. 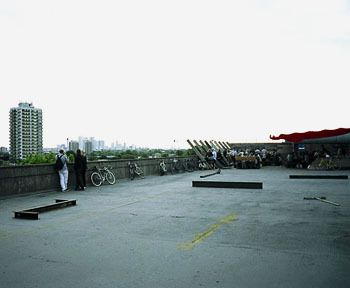 Not only does it make use of a huge and beautiful space that otherwise would hang unnoticed in the Peckham sky, but it goes to show that a group of young people with an idea, however far fetched and unruly, can make it happen. Franks Bar, pirate ship in the sky, is open until the end of September. Go. Look, drink, pee, sigh… enjoy.